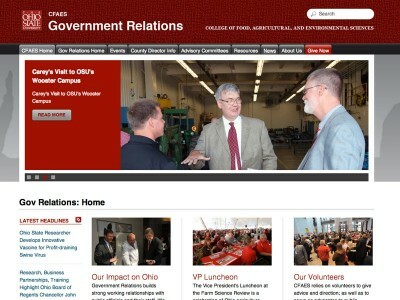 The college continues to update its web presence and add new sites to the cfaes.osu.edu homepage. Two sites that have been launched in the past several months focus on Government Relations and Development. Government Relations: This resource is where faculty and staff may find all relevant information and resources related to working with and engaging elected officials. Specifically, the site has information related to upcoming and past events with photos, information for county Extension directors, listings of key advisory committees for Extension and OARDC, and related news. Development: This resource is available to all faculty and staff as well as current and potential donors. Site visitors are able to find information related to priority areas to support, the impact of giving to the college, profiles of donors, and information about upcoming events and activities. If you have attended a recent event, be sure to check out the site for photos!